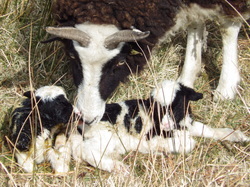 Our pedigree flock, Island Jacobs, was established in 2008. We currently have 10 breeding ewes. The flock lamb indoors in February and are turned out to grass (weather permitting) in April.